Former professional player and manager John Cornforth has joined Blyth Spartans as the assistant to boss Tom Wade. It is a return to south east Northumberland for the 49-year-old after he spent a short period at Croft Park under Wade three years ago. “I’m delighted to be back at Blyth,” said Sunderland-based Cornforth. “I needed to get back into football after a break following working as a coach in Asia, the Middle East and the Caribbean. “Once Tom asked me for a chat it was only ever going to be Blyth for me. “I’ve kept in touch with Tom and I know we’re on the same wavelength. Cornforth notched up 322 league starts as a professional for clubs such as Sunderland, Swansea, and Cardiff and Exeter, and he picked up two Wales caps before a cruciate ligament injury halted his playing career. He then went into management and took charge at Exeter and Torquay. Whitely Bay born Cornforth has nothing but praise for Spartans – on and off the pitch. He said: “I know a lot of the players and they are great lads. I know we’ve lost a couple of players, but having Stephen Turnbull back is huge. He’s my type of player. I too was a play-making central midfielder. “Off the pitch there’s so much happening, like the new 3G surface, and the media team, who do such a lot they seem be being regularly poached by other clubs – maybe they should be on contracts. “In addition, I understand there will be news soon on the commercial side, and the pitch is looking superb. 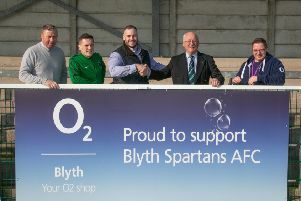 “Blyth is a proper football club; steeped in history. And I’ve always received a tremendous welcome whenever I’ve been back.